By sorting particles in the game Binary Fission, players help increase the reliability and security of critical software. Sophisticated gamers can help improve security of the country's critical software by playing a new game created by UC Santa Cruz researchers in partnership with SRI International, the Air Force Research Laboratory, and the U.S. Defense Advanced Research Projects Agency (DARPA) Crowd-Sourced Formal Verification program. 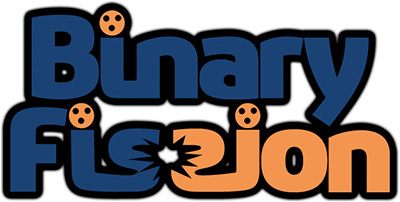 Binary Fission was designed as a fun and accessible way for "citizen scientists" to help increase the reliability and security of mission critical software by verifying that it is free of cyber vulnerabilities. From a gaming perspective, the goal of Binary Fission is simple: sort colored atomic particles or "quarks" in as few steps as possible. Players use up to 100 filters to sort the particles into separate pools. 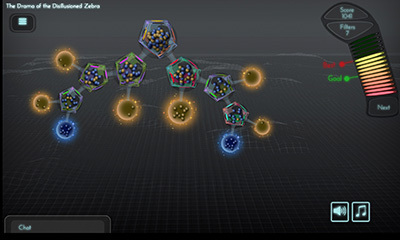 As players move their cursor over a particular pool, they are shown in real time how successfully a particular filter would sort the quarks in that pool. Binary Fission also allows more sophisticated interactions: rather than defining behavior of software elements from scratch, players can mix and match pre-made descriptions. The search for such descriptions--technically called "loop invariants"--takes advantage of visual pattern recognition that people are better at than computers. "We're very excited about the play experience in Binary Fission," said lead game designer Heather Logas of UC Santa Cruz. "Informed by new research about formal software verification and inspired by the citizen science phenomenon, the game is both very playable and also should contribute well to the underlying science problem." Examples of critical software behavior, along with some pre-made invariants, are used to generate each level in Binary Fission. The quarks in the game actually represent values of variables inside the critical software, and the sorting filters represent the potential invariants to be explored and applied. By combining filters efficiently, players can help to verify that the software is free of security vulnerabilities. Binary Fission also emphasizes community, an important aspect of successful citizen science projects, through integrated chat, active community management, and regular community events. "The auxiliary Binary Fission feature set is very light, since our goal is to keep players focused on solving problems," said John Murray, program director in the Computer Science Laboratory at SRI International and principal investigator for the overall project. "However, as a citizen science project, our recruitment policy draws in players who are interested in solving cybersecurity issues." Currently, formal software verification is rarely used because relatively few people have the necessary training in verification techniques. In addition, finding loop invariants in software programs has historically been a challenging task requiring extensive training and insight. "SRI is well versed in formal software verification, with over a quarter of a century spent assuring that mission-critical computer systems are error-free, secure and interoperable. We are pleased to work with our partners in DARPA's highly innovative, creative and fun program," said Patrick Lincoln, director of SRI's Computer Science Laboratory. "We learned a lot of valuable lessons with our first game of this type, Xylem. For our gaming approach to succeed, we need a more sophisticated game for a more sophisticated audience. We have leveled up our research, and with more automation, interaction and sophistication, Binary Fission is our best game yet." Binary Fission is one of five games that DARPA is releasing under its Crowd-Sourced Formal Verification program. All games, including the first SRI-and-UCSC-created game, Xylem, are freely accessible through the Verigames website. UC Santa Cruz and SRI are also collaborating with researchers at CEA, the French Alternative Energies and Atomic Energy Commission, to develop tools for software analysis and formal verification that feed into Binary Fission. This material is based upon work supported by the United States Air Force Research Laboratory (AFRL) and the Defense Advanced Research Projects Agency under Contract No. FA8750-12-C-0225. Any opinions, findings and conclusions or recommendations expressed in this material are those of the author(s) and do not necessarily reflect the views of AFRL or DARPA.